Fries' Rebellion is the last significant Deitsch uprising. It is named after John Fries, who was a hero of the Whiskey Rebellion but who was also considered a traitor as a result of the rebellion that bears his name in English. The Deitsch name, Heesses Wasser Uffschtand (Hot Water Uprising), relates to the Deitsch women who chased away the tax collectors using boiling water as a weapon. Had Fries' Rebellion been successful, life in the Deitscherei might be very different today. This was a watershed event in Deitsch history, and a presentation at Goschenhoppen tomorrow affords us with a great opportunity to learn about the causes of the rebellion. 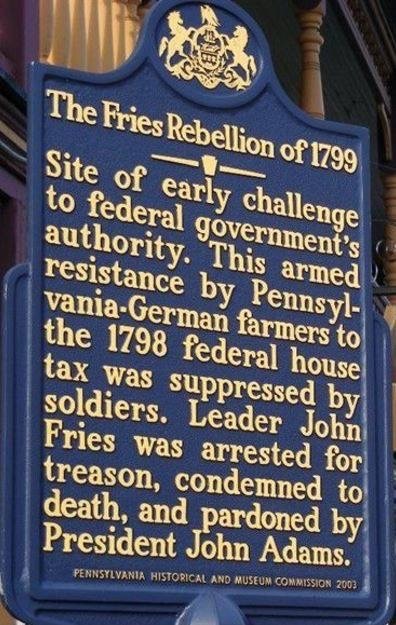 The Fries Rebellion: Insurrection or Civil Disobedience?